The primary objective of Activity 1 of the project is to obtain the methods for estimation of the remaining life of water mains. Usually, these water pipes are subjected to significant stresses due to internal (water pressure) and external (traffic and earth) loads. As many of these pipelines have been laid sometime in the last century or earlier, in most cases their condition has deteriorated primarily by electro-chemical and (or) micro-biological corrosion. Corrosion activity (internal and external) can manifest in various forms , but in many cases will lead to a reduced pipe thickness, which in turn will lead to increase in pipe stresses induced by these external and internal loads. The stress state of the pipeline can be different depending on the type of corrosion pattern in the pipe. Buried water mains can have different types of corrosion varying from uniform corrosion, patch corrosion or pitting corrosion (see Fact Sheet No. 2). 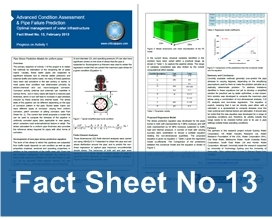 The current fact sheet proposes a model that can be used to compute the stresses of the pipeline in uniformly corroded pipes (also applicable to new pipes), which considers most external/internal factors in detail. The stress calculated for a uniform pipe thickness also provides the reference stress required for pipes with other forms of corrosion.